- The rolls are turned, ground and polished, high carbon steel, providing rigidity and resistance to wear and abrasion. - Capacity, mild steel 16 gauge 16 gauge. - Maximum forming length : 49" 49". 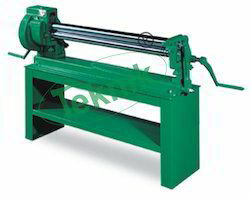 Plate bending slip roller Quality accuracy. CNC laser cut machine body. High grade CI bushing. High chrome tommy handle and screw. Easy rapirable & disamble all parts of machine. Rigid heavy fabricated base frame. Used in Roller Flour Mills, Flour Industries for dehusking (Chokar) of wheat as well as pulse (dal) industries to remove husk of raw pulses. Also use to polish of pulses (Dal). - Surface Treatment: Zinc, Galvanized, Silver, Nickel, Chrome, Tin, etc. - Comprising of 3 machined rollers; 2 rollers having grooves permitting sheets previously wired. 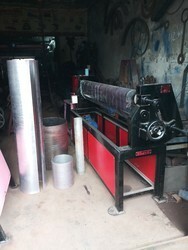 One roll has adjustment for various diameter of cylinders to be formed.